With all four major carriers now selling the Samsung Galaxy S III, it’s now the perfect opportunity to check out some of the wonderful accessories that are being made available for the latest “it” smartphone. Already, we’ve taken a peek at Spigen’s line of cases for the Samsung Galaxy Note, but seeing that the latest member in the family is penetrating the hearts and minds of consumers all around, it’s fitting to see what Spigen has to offer. From minimalistic to wallet-type cases, Spigen appears to have a broad range of cases to appease nearly any appetite. However, we’re getting better acquainted with three particular models that seem to stand out the most. Knowing that, let’s take a closer look at the Spigen Ultra Thin Air, Neo Hybrid, and Leather Wallet Valentinus cases for the Samsung Galaxy S III – all of which are priced respectively at $19.99, $26.99 and $39.99. First up on the chopping block is the Spigen Ultra Thin Air case for the Samsung Galaxy S III. As its name implies, it’s a minimalistic plastic case that doesn’t add much bulk or weight to the handset’s existing lean figure. Available in a wide array of colors, the silver one we’re checking out maintains a very clean appearance and is extremely resilient in being dirtied by smudges or fingerprints. On top of that, the plastic case adds some level of protection. Looking around the case, there are cutouts for the smartphone’s camera, LED flash, speaker grill, power button, and volume control. With the latter two, however, the case makes the buttons recessed and a bit difficult to feel out. With the top and bottom edges, they’re left exposed to the elements. Thankfully, Spigen is kind enough to include a clear plastic screen protector with the case, which is easily applied and leaves very few bubbles along the way. 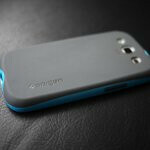 Second on the chopping list is the Spigen Neo Hybrid case for the Samsung Galaxy S III. Similar to the Ultra Thin Air case, the Neo Hybrid is quite form fitting to minimize any added size to the smartphone. Comprised out of two components, the inner runner portion does a great job in offering some protection against the elements, while the second component to the case, the neon colored plastic bezel, adds a bit of style. In addition to liking its clean appearance, the soft rubbery shell of the case provides enough comfort when grasping the handset. Oh yeah, did we mention that it also comes included with a plastic screen protection as well? Fortunately, the entire sides of the smartphone are well protected thanks to the neon colored bezel, which can be swapped for more personalization. Of course, there are cutouts throughout the case, but we do like it that the volume control and power button have a prominent feel. Looking along the bottom right corner of the case, etched into the neon blue bezel are the words “Designed by SPIGEN in California”. Lastly, there’s the Spigen Valentinus Wallet Case for the Samsung Galaxy S III. No doubt, it takes the burden out of carrying along both your wallet and smartphone. Naturally, there’s a sense of elegance with this case, as it’s made out of leather. Again, there are cutouts for the camera, LED flash, and speaker grill that enables us to use the device while it’s within the case. Convenient, right? Inside of the Valentinus Wallet Case is an Ultra This Air case that keeps the Samsung Galaxy S III snuggly in place. Using the snap-on strap, we’re able to shut the entire thing and stuff it into our back pocket. As much as we’d like to replace our wallet with this, it’s a bit difficult to do that because there are only 3 slits in the case – with another one that can accommodate some cash. Therefore, if you want to carry more than 3 credit cards or IDs, you’ll have to look elsewhere. Spigen cases are beautiful cases but fragile as hell! nice! i just got my S3 couple days ago and have been looking for some cases. Do they have a store or is it online only? are they available now? You can find a lot on Amazon, but their store iswww.spigen.com. One thing that I envied about Apple products was the fact that they had such a plethora of cases and other accesories that you can choose from. Its great to see other phones other than Apple's getting the same treatment.